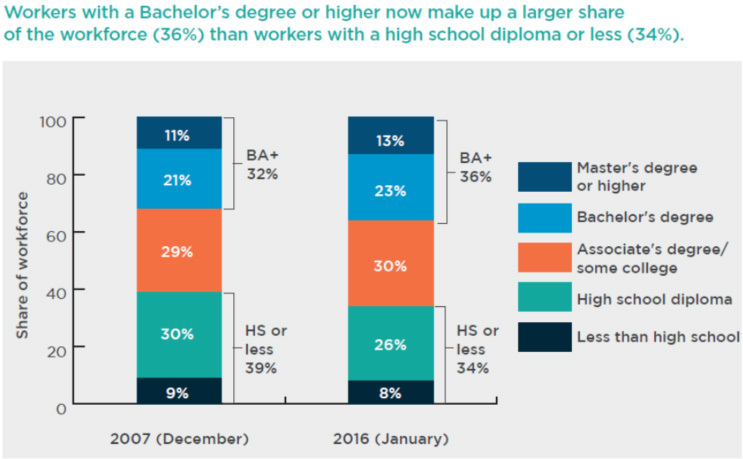 For the first time in U.S. history, college graduates outnumber high school–educated workers in the labor force, highlighting a national shift in employment opportunities that now favors workers with postsecondary education. 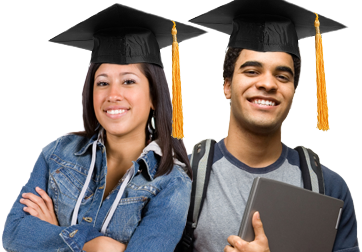 That finding comes from America’s Divided Recovery: College Haves and Have-Nots, a new report from Georgetown University’s Center on Education and the Workforce (CEW). 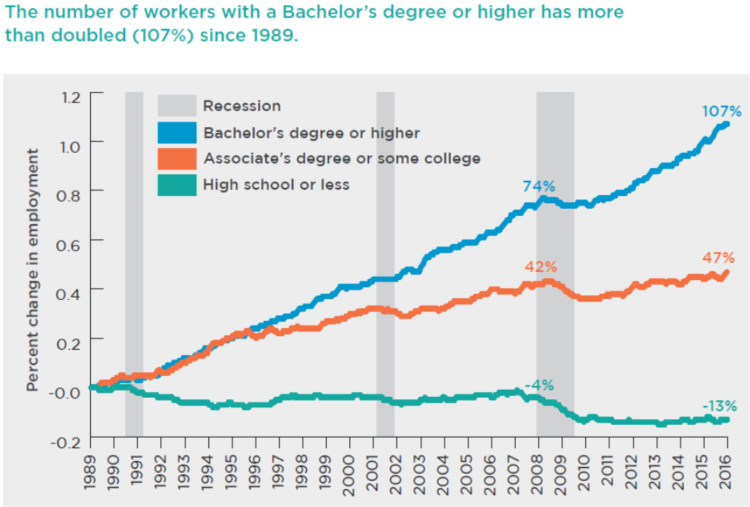 As shown in the graph below from the report, workers with at least some postsecondary education now represent two-thirds of the workforce, compared to workers with a high school diploma or less who represent just 34 percent of the labor force—a percentage that has declined steadily during the last decade. 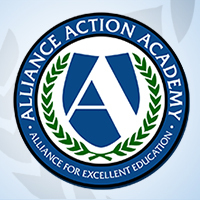 Since the end of the Great Recession, the economy has added 11.6 million jobs and 99 percent of them—11.5 million—have gone to workers with at least some postsecondary education, according to the report. Workers with at least a bachelor’s degree have fared the best, gaining 8.4 million jobs since January 2010, when the nation began its post-recession economic recovery. Workers with a high school diploma or less, though, essentially have experienced no job recovery, the report says. These workers lost 5.6 million jobs during the recession but gained back only 80,000 jobs during the recovery. These employment disparities illuminate changes in the job market that began even before the recession took hold in 2007. Since the second half of the twentieth century, job creation has shifted toward industries such as healthcare, consulting, business, finance, education, and government services that employ a high share of workers with postsecondary education and away from production industries, such as construction and manufacturing, that historically employed workers with lower levels of educational attainment, the report explains. For instance, in 1947, production industries employed nearly half of the workforce, but today, these industries employ only 19 percent. Meanwhile, industries that employ managerial and professional workers accounted for only 28 percent of the workforce in 1947 and they now account for 46 percent. This shift accelerated in the early 1980s “when the wage premium for college graduates began its meteoric rise,” the report says. Since that time even declining industries, like manufacturing, have shifted toward hiring workers with more education. Although overall employment in manufacturing has declined 32 percent since the mid-1980s, employment of workers with at least a bachelor’s degree has grown by 70 percent in that industry alone, according to the CEW. In the past decade, management occupations and healthcare professional and technical occupations (such as registered nurses, physicians, surgeons, therapists, and others) have added the most jobs—1.6 million and 1.5 million respectively for these fields. Meanwhile, the number of jobs available in construction, manufacturing, and office and administrative support—fields that traditionally have hired large numbers of workers without a college degree—still lags behind prerecession levels. Today, the economy has 1.6 million fewer construction jobs, 1 million fewer manufacturing jobs, and 1.4 million fewer office and administrative support positions than before the Great Recession. America’s Divided Recovery: College Haves and Have-Nots is available at https://cew.georgetown.edu/cew-reports/americas-divided-recovery/.